Termites are the most important wood-destroying structural pests in the southern United States. According to some estimates, over $2 billion are spent annually in the United States controlling or preventing termite infestations. In North Carolina, our main problem is with subterranean termites, i.e., termites that normally live below ground and may move up into a structure where they cause damage. Termites are "social insects," i.e., they live in a nest or colony which is typically found underground, often near a tree, stump, wood pile or other source of 'food.' Each colony contains a king and queen who are brown in color. They are wingless now but started out having wings and "swarming" from their original home or nesting site where they developed. The queen is able to lay thousands of eggs each year. and continues to do so for about five years. There are also soldier termites which have large heads equipped with large mandibles ("jaws"). The soldiers protect the colony from invaders (such as ants). 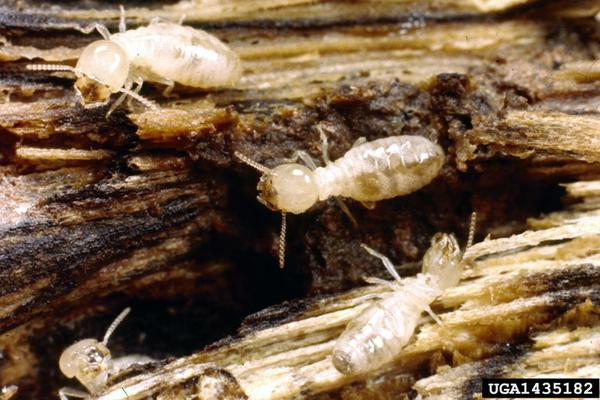 The bulk of the termite colony consists of thousands of whitish workers who serve various roles. Some workers maintain the nesting site and take care of the queen and the newly hatching immatures (sometimes called "larvae"). Other workers go out and actively forage (search) for food. The foraging workers are the ones that we typically find infesting wood. As the colony grows, the workers expand both the nest and their feeding area. Depending on the species of termite, a mature colony can contain 200,000 to 2,000,000 workers, although many colonies contain as few as 50,000-60,000. Studies have also shown that termites from a single colony may forage across an area of one-third acre and travel over 200 feet from their nest. One acre of land may support several termite colonies (although this doesn't mean that all of them are invading your home!). A large termite colony does not usually occupy a single underground nest. As the foraging area expands the colony actually splits to form several smaller "nesting sites." Swarming - A termite colony can mature in 3-5 years and begin to produce swarmers (winged adults). 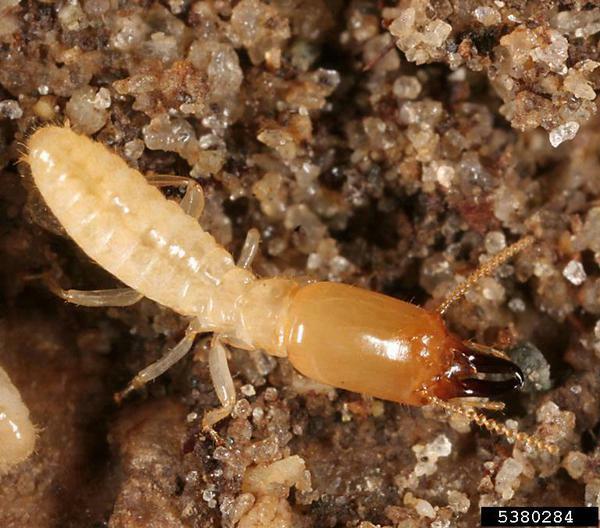 In North Carolina, we have at least three native species of subterranean termites that begin swarming in late winter and continue into September or October. Swarming usually occurs during the day, particularly on warm days following rain. Swarmers found outdoors near tree stumps, landscape timbers, etc., are not an indication that your house is infested, but they serve as a reminder that termites live around us. When swarming occurs indoors, it usually means that you have an infestation somewhere within your house. Several species of ants also swarm at the same times of the year as termites. Winged termites and ants look somewhat similar, but you can tell them apart by certain features. If you're not sure whether you have termites or ants, show them to a pest management professional or bring specimens to your county Cooperative Extension center for identification. Unlike ants, termites do not roam around on the soil surface or out in the open. They will either tunnel through the soil or into wood (or other material) or else travel inside pencil-size (or larger) "mud tubes" that they build from soil, wood particles and other materials. You will find these tubes on foundation walls, floor joists or other parts of the house. Tubes may also hang from the floor system (see picture below) or may be found protruding from cracks between boards and beams and even through holes termites may chew through sheet rock on walls and ceilings. Break open the tubes to see if termites are still active. An empty tube doesn't necessarily mean that termites are gone; they may have simply abandoned this particular tunnel. 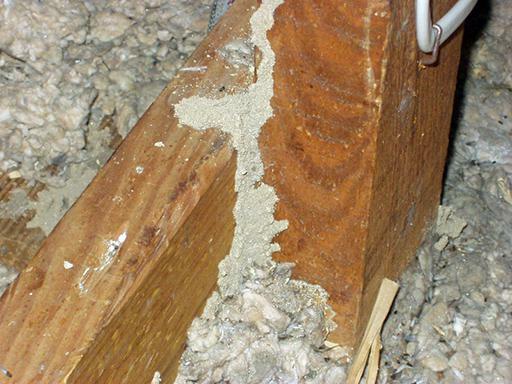 Termites often rebuild damaged tubes, which is another indication of current activity. 'Old' tubes are dry and crumble easily, leaving behind "etching" on the surface that may be visible for years (an indication that a house had termite activity at some time). Without knowing the inspection history of the house, it is impossible to tell or guess at the age of tunnels or etching. Tubes that are found on ceilings or on upper levels of a building may indicate that you have an aboveground ("aerial") infestation, i.e., the termite colony actually lives in the building and the termites are traveling up from the soil. Mud tubes built by an aboveground colony usually contain materials other than soil, e.g., wood and sheet rock or whatever the termites are feeding on. 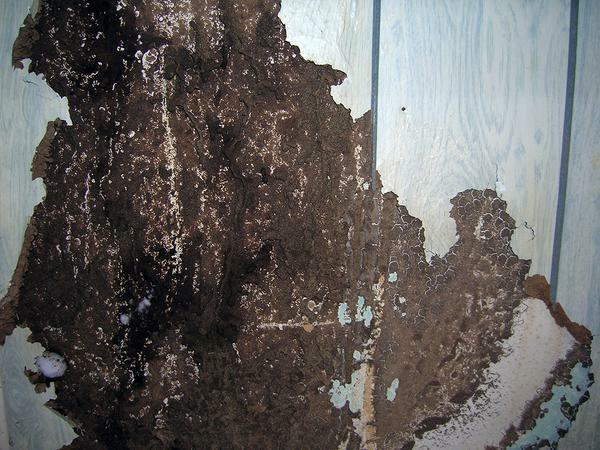 These secondary infestations occur when there is a serious moisture problem or leak somewhere within the structure. 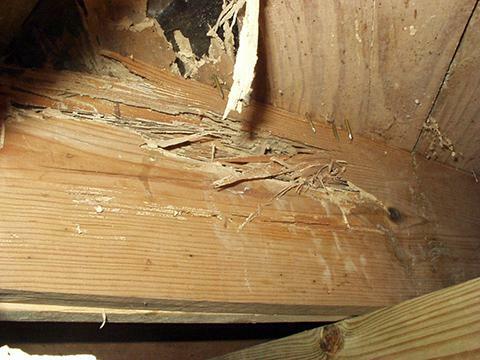 In such situations, a thorough inspection may require removal of siding or interior wallboards, etc. More importantly for you, these aboveground infestations cannot be controlled with the usual soil treatment (see below) and are typically excluded from a termite contract warranty. In these situations, finding and correcting the moisture problem is the first step to eliminating the termites. We tend to think of termites as feeding/injuring wood only. Termites actually feed on almost anything that contains cellulose, the main component of wood, including wood paneling, paper products, cardboard boxes, art canvases, the paper covering of sheet rock, carpeting, etc. While foraging and feeding, they may tunnel through non-cellulosic materials, such as plastic and foamboard. According to some research, a colony containing 60,000 workers could consume the equivalent of one foot of a 2" x 4" piece of lumber in slightly over 5 months. In reality, the amount of damage that termites cause depends on many factors. In areas with cold winter temperatures, termite activity (and feeding) often declines, but does not necessarily stop. If the termites are well-protected from colder temperatures (e.g., underneath a slab), then activity may continue year-round. From a practical perspective, serious termite damage usually takes about 3-8 years. Have your house inspected by a pest management professional. Don't rush your decision on how to deal with any termite problem. What should be done to eliminate the termite activity? What kind of guarantee does the company offer? Is there damage that should be repaired or at least examined by a contractor or engineer before control measures are performed? Simply spraying swarmers or the surface of accessible infested wood may kill the termites that you see now, but it does not stop the infestation nor does it protect your house from future attacks by termites. The most common type of termite treatment involves a "trench and treat" where a liquid insecticide ("termiticide") is applied to the soil surrounding critical areas of your house. The most critical area needing treatment is the foundation wall (see the image to the right). The soil is trenched 6" deep and about 4-6" wide. For houses with crawlspaces, the soil along the interior foundation wall must be treated at least within 4 feet of identified signs of termite activity. 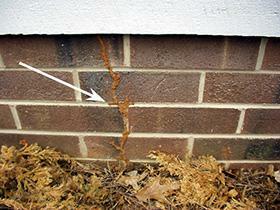 In some cases, the soil around supports (such as piers) underneath the house are also treated. 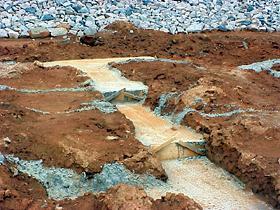 In order to be effective, this treatment must extend down through the soil to the top of the foundation footer. When applied correctly, this treatment forms a continuous chemical barrier that should prevent termites from reaching the foundation and piers in your house. Concrete slabs that attach to the house, for example, a garage floor, or the slab of an earth-filled porch. Voids inside foundation walls, piers, etc. within 4 feet of known termite activity. You can view the state regulations or obtain a copy from the North Carolina Department of Agriculture & Consumer Services - Structural Pest Control and Pesticides Division (NCDA&CS) in Raleigh. These specifications are the current minimum requirements for a treatment under state regulations. Some pest control companies still drill and treat the entire foundation wall and piers. Some companies offer "spot treatments", i.e., they treat only the area(s) of the house where termites are found. A spot treatment may seem like a good idea because it costs less than a full treatment. However, there are some important points to remember. First, a spot treatment may not correct the problem. Second, except when done under an existing contract, a spot treatment often carries a very limited guarantee (or no guarantee at all). It's your house, your money, your choice. Don't let economics be your only determining point about how to protect your house from termites. On a new contract (treatment), any treatment procedures that will not be done according to NC regulations must be noted on an official Waiver of Minimum Standards form. You must sign this form as part of your contract. If you are asked to sign a waiver form make sure you understand what each waived item means (i.e., what work is not being done and why it is not being done). Termite Baits - Another option for treatment is the use of a termite bait. These products are used differently from liquid treatments and may be used with a liquid treatment. See Termites - Baiting Systems for more information about termite baits. How will the treatment will be done? Does the proposed treatment require a waiver? If so, what treatment specifications will not be done? Why aren't they being done? What type of guarantee is included under the contract? Some contracts offer a "retreatment-only" guarantee. If there is a repair guarantee, what is or is not covered by the guarantee? Does signing any waiver form affect the guarantee in any way? What are the terms for renewing or maintaining the contract? (see the section below on Annual Contracts). A list of commonly-used termiticides can be found in the current edition of the North Carolina Agricultural Chemicals Manua​l. You can also contact NCDA&CS for a complete list of all currently registered termiticides. Although there are termiticides available for homeowner use, we do not recommend the "Do-it-Yourself" (DIY) approach for chemical control of termites for several reasons. Many products have instructions for spraying the surface of infested wood. Simply spraying swarmers or the surface of accessible infested wood kills the termites that you see at that time, but it does not protect the interior parts of that infested wood nor does it protect your house from further termite attacks. If you see termites in one area, don't assume that it's the only infested area or that what you see is the extent of the problem in that area. Only a thorough inspection can show if the termites are also feeding someplace else and even then, termites could be infesting your home in areas that are inaccessible (and uninspectable. Also, simply spraying the soil surface and/or exterior foundation wall is not going to stop a termite infestation below ground and possibly entering your home from below ground. As previously explained, a proper termite treatment can be very complex. You must trench and treat the soil along the foundation and on all sides of piers. The trenches must be 4-6 inches wide and 6 inches deep, depending on the depth of your foundation's footer. You can't count on treating only the exterior side of your foundation and crawlspaces can be difficult (and potentially hazardous) places in which to work particularly if you're trying to trench and treat the soil with a pesticide. Most pesticide labels require pesticide applicators working in confined spaces, such as crawlspaces, to wear specific personal protective equipment such as a cartridge-type air filtering respirator (not simply a dust filtering mask) You need a substantial volume of diluted chemical. Termiticides are applied to the soil at the rate of 4 gallons per 10 linear feet per foot of depth (i.e., the depth from the soil surface down to the top of the foundation footer). Most footers in eastern and central North Carolina are about 12-18 inches below grade (soil level). Therefore, as an example, a house that has a 40 ft x 30 ft "footprint" (120 linear feet) and a one-foot deep footer would require 48 gallons of termiticide spray just to treat the soil along the outside foundation wall. The total amount of chemical needed will depend whether the interior foundation wall needs to be treated (in part or all of it) and on other aspects of the building construction (such as attached garage slabs, earth-filled porches, etc.) but could easily exceed 100 gallons. Houses with basements or those built on slopes may have deeper footers and so you would also need the equipment to treat to the necessary depth which could be as much as 4 feet. Few homeowners have the equipment to mix and apply large quantities of chemical properly and safely. As mentioned in the previous section, a proper treatment includes drilling and treating concrete slabs (such as porches and garages) as well as voids in foundation walls and piers that are adjacent to the termite infestation. 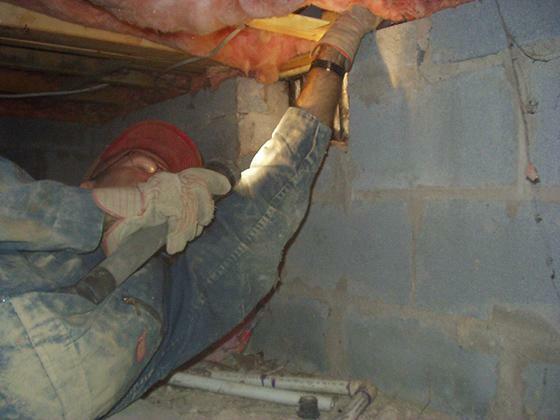 This part of the treatment requires some understanding of construction, plus specialized equipment and training to avoid injuries or damage to underground utility lines or to the masonry. Although you could skip this part of the work, an incomplete treatment may not solve the problem and may leave your house vulnerable to continued or future termite attack. The cost of the chemical is higher for consumer products. For example, in 2000, one brand of permethrin-based termiticide available at a large retail store in Raleigh, NC was priced at approximately $17.00 per pint. According to the product label, the chemical is applied at a 0.5% concentration which requires adding 5 ounces of chemical per gallon of water. Using the example of the house mentioned above, your cost to purchase the chemical needed to treat just the soil around the foundation (56 gallons) would be nearly $300. Liquid treatment is considered too difficult. 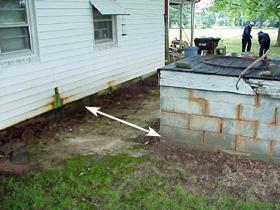 There is a foundation drain that may lead to a pond or creek. The treatment requires extensive drilling of floor slabs through wooden, tiled or carpeted floors, or through other masonry that could be damaged. Liquid treatment could be illegal, e.g., there is a well or cistern under or too close to the foundation wall. Liquid treatment is considered unacceptable for whatever reason. The treatment requires drilling of floor slabs through wooden, tiled or carpeted floors, or through other masonry or you do not want liquid pesticides applied under/around your house. In these situations, there are few alternatives such as termite baits or mechanical control (currently available only for homes under construction). Although local or "spot" wood treatments stop termite activity in the treated area, they are not complete termite treatments and they will not stop termites from attacking wood in other areas. One treatment option uses the chemical disodium octaborate tetrahydrate (DOT). This borax-derived chemical is applied to critical wooden structural components in the crawlspace and parts of the framing in a house under construction. Data provided by product manufacturers suggest that termites will not build their tubes over treated wood nor do they cause any structural damage to treated wood. However, depending on the type of construction involved, it may be possible for termites to bypass this treatment and attack nearby untreated wood such as baseboard molding, trim, etc. Chemicals that are suitable for wood treatments are listed in the current edition of the North Carolina Agricultural Chemicals Manual. In North Carolina, structural fumigation (sometimes called "tenting") is rarely used for our common subterranean termites. Most residential fumigations are performed for drywood termites, which are relatively uncommon in North Carolina, or for wood-boring beetles particularly in log homes. In most cases, the termite treatment on your house includes a one-year termite protection warranty from the pest control company. After one year, you must decide if you want to continue your contract. The cost of a renewal for a house that was treated with a liquid termiticide is typically between $85-$200, depending on the size and construction type of the house and perhaps the type of guarantee (explained below). The most frequently asked question is "Do I really need the annual contract?" Essentially, this is a matter of personal choice, i.e., how much "peace of mind" do you want in terms of protecting your home from termites. Remember: termites are always around us and always looking for "food" (wood). That fact alone does not mean that they are constantly attacking your house. It simply means that there is always some chance that termites might find their way unseen into your house. Annual termite contracts are somewhat like medical insurance policies. You are paying to protect your home against the possibility of termite attack. An annual contract can be an effective way of preventing termites from causing significant damage over the years. Likewise, this 5-year requirement by the EPA does not mean that the chemical is totally ineffective after 5 years. This last point will be addressed down below under "Booster Treatments". It's important to understand that an annual contract does not mean that the pest control company re-treats your house every year. Unless there is some evidence of termite activity in the house, annual treatments are actually illegal under most termiticide labels (and therefore illegal under both state and federal law). With a termite protection contract, the pest control company inspects (or should inspect) your house for termites annually. If they find evidence of termite activity or if you find evidence of termite activity, then the company takes some appropriate measures, usually a local or 'spot' treatment of the infested area. You should not have to pay for any additional treatment to correct a termite problem; that cost is covered by your annual fee. In return, the company expects you to do your part in maintaining your house in a condition that does not increase likelihood of termite problems. For example, routine home maintenance helps prevents moisture problems or other conditions that are conducive to termite activity in the area, i.e., if termites find such area, they are more likely to remain active or expand their activity in that area. Make sure that the termite inspector explains any problem areas that he/she finds during the inspections so that you can correct these problems as soon as possible. In some cases, your failure to correct reported problems may void your termite protection contract. If you're not home when the house is inspected, the inspector should leave some sort of notice or report about his/her findings. If you're not clear on the results, call the company's office and ask them to explain if anything important was found. Does my contract coverage termite damage? An important point about your contract concerns damage. Many people assume that their contract automatically covers damage repairs, but that is not always the case. Many termite protection contracts offer "retreatment only", i.e., the pest control company will retreat areas as necessary in order to correct the problem, but the retreatment is all they are obligated to do under the terms of this type of contract. Other contracts cover a retreatment as well as the cost of repairs to wood or other structural components that are damaged by the termites. These contracts may have a higher annual renewal fee than a "retreat-only" contract. While a repair warranty may be an important option to you, but it's important to understand the limits of the repair coverage. If your house is infested when you have it treated, then you should assume that there could be hidden damage, e.g., to wood framing behind a wall. If you have had the contract since the house was built (and presumably it was not built with termite damaged wood), then any damage should be covered by the terms of the contract. However, this also assumes that you have upheld your part by not disrupting the treated soil or allowing termite-favorable conditions to develop on/around your home. On the other hand, if you buy an previously-owned home that has not had a contract (regardless of when it was last treated), then the contract likely excludes "existing damage." What does that mean? For example, if in the course of renovating your house you find termite damage behind a wall but there are no termites found, then this situation is usually considered to be "existing damage" (i.e., prior to the start of your contract with the pest control company). Therefore, it is excluded from your repair guarantee because there is no way to determine if the damage occurred before or after the start of your contract. We are not aware of any scientifically sound way to precisely determine the age of termite damage. This exclusion is not simply an excuse for the company to avoid their contractual obligations to you. This is a legitimate issue that you need to understand clearly and should have it explained to you BEFORE you sign the contract. 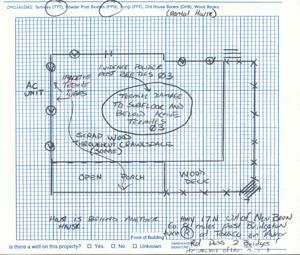 Your original contract which should include a graph of the house with details of the initial inspection and the treatment specifications. All annual inspection reports and any noted changes in the conditions of your house, including new signs of termite activity, moisture conditions, etc. One other important point of note. Your termite protection contract is strictly that - a contract for termites and termite control. Unless specified otherwise, your contract does not include inspections or coverage for other wood-damaging pests, such as carpenter ants, carpenter bees, powderpost beetles or wood-decaying fungi (although the inspector may note such problems and bring them to your attention). For additional advice on consumer protection and your termite contract, read the publication A Homeowner's guide to Termite Control Service Agreements and Warranties by the North Carolina Department of Agriculture & Consumer Services. Current North Carolina Building Code requires that all residential structures under construction have some sort of termite protective treatment. 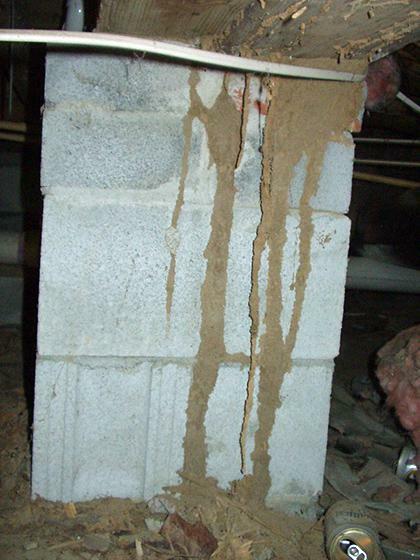 The particular type termite treatment does not have to be a liquid treatment. It is a matter of choice by the builder and/or property owner but it must be a method approved by the North Carolina Department of Agriculture & Consumer Services. As mentioned previously, modern termiticides applied properly to the soil are typically effective for 5-10 years. This doesn't mean that after 5 or 10 years every termite in the neighborhood makes a mad rush at your house. It's simply that the odds favor the termites eventually finding their way in at some point, depending in large part on how you maintain your house and property. As mentioned earlier, EPA currently requires that liquid termiticides be effective for at least 5 years. This in no way means that the chemical is completed gone after five years. Many people wonder if they need to have their house retreated for termites after a certain number of years have passed. If you have a termite protection contract, some companies may require a "booster treatment" after some period of time in order to maintain your guarantee. Such a requirement would be specified in your original contract; so read your contract carefully BEFORE signing it. 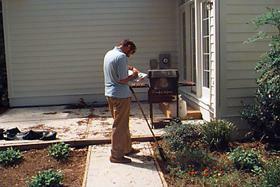 These treatments are usually partial retreatments, such as just treating the soil around the foundation. More importantly for you, the cost for this treatment is usually not covered by your current contract and you will have to pay for the work (often $600-$1,200, depending on the size and complexity of the construction). If you decide to discontinue your contract you'll either be without a termite protection policy or you will need to find another company which may or may not require a similar treatment. At that point, you're back "square one" and evaluating what type of service and contract the company (or companies) offer. As an option to having a booster treatment, the company may offer to continue your current contract but at a significantly higher annual renewal (perhaps 25%-50% higher). Again, read your current contract to see if there are terms concerning booster treatments and/or increases in your annual fee. An important point to consider if you need to decide on getting a booster treatment or switching companies - if you currently have a repair warranty and want to continue with one, you will again have the exclusion of "current/old" damage if you switch companies. In general, if a repair contract is that important to you AND you have had your house under continuous contract with the same company since the day it was built, then you're probably better off staying with that original company because ANY termite damage that is found must have occurred during the period of your coverage and therefore it IS covered by your repair warranty. Other than with a contract requirement, a pest control company may only suggest that you get a termite treatment if you do not have an identified termite problem. They cannot tell you that need one. If you don't have a termite problem, then a preventive treatment is a matter of YOUR choice. You can follow the old adage of "if it ain't broke....." However, it falls to you to be responsible for knowing "when it's broke", which is why annual inspections are valuable. You can simply wait until a problem occurs and then have a treatment done at that time. On the other hand, if it would make you sleep better at night knowing that your house has been treated and you have some sort of contract, then it's your money, your house, your decision. Alternatives to chemical control of termites (i.e., to control an active infestation) are very limited. Long term, non-chemical approaches to termite control focus on prevention. Here are a few approaches that may help with, but not necessarily prevent or likely eliminate, an active termite infestation. State regulations require pest control operators to remove termite tubes as part of a complete liquid termite treatment. Removing the tubes provides a way to determine if a termite infestation remains active after treatment or if the termites reappear in the same area later. Scraping away mud tubes as the sole means of control can be impractical and is probably unwise in many cases (such as with slab construction where much of the termite activity may be inaccessible). The tubes are an indication that termites are active around the house. What you can't easily determine, even with a careful inspection, is whether termites may be active in a foundation or wall void or some other visually inaccessible area of your home. Although it's convenient, it is not a good idea to turn your crawlspace into a general storage area, particularly for items made of wood, cardboard or paper which can serve as food for termites. The same problem arises when tree stumps are left under houses during construction. State regulations require that liquid termite treatments (but not bait treatments) include the removal cellulose debris of a size that can be removed with an ordinary garden rake. Removing the debris helps reduce food resources that could be used by termites. This topic is discussed under preventive measures. If you are not satisfied with the service you are getting from a pest control company or you feel that your questions are not being answered, you have some recourse. First, you should always talk to the company's manager or owner to make sure that the problem is not simply a matter of misunderstanding or miscommunication between you and the technician servicing your house or that the service person is not accurate in explaining details. If you're still not satisfied with the response you receive from the company, then contact the North Carolina Department of Agriculture & Consumer Services for assistance.